Thirty years after Led Zeppelin ended, Robert Plant has reached a second career high. His latest hit album was tracked and mixed by Mike Poole, using a mouth‑watering selection of vintage equipment. The million‑dollar question for every ageing rock dinosaur is how to avoid going the way of the dodo, or, at the very least, Rod Stewart. The question has been answered in various ways, in most cases by pigheadedly refusing to adapt to age and changing times, and simply carrying on as if everything is as it ever was. There is another strategy, however, which may be described as growing old gracefully. One of its main proponents has been the now 62‑year old Robert Plant. While it greatly frustrates Led Zeppelin fans, it has done no harm to Plant's credibility that he's steadfastly refused multi‑million dollar offers to tour with his former band. In addition, during his post‑Zep solo career Plant has repeatedly managed to defy expectations and explore different and unanticipated musical directions. Plant's upward career path started with an album of bluesy rock covers, Dreamland (2002), followed by a mixture of rock and world music, The Mighty Rearranger (2005). Only moderately successful from a commercial point of view, both albums were critically lauded, and each garnered two Grammy Award nominations. The roof blew off in 2007 with Raising Sand, a duet album with bluegrass singer Alison Krauss. An exploration of Nashville‑influenced Americana produced by T‑Bone Burnett, the album won a staggering five Grammy Awards, including for Album of the Year, went platinum in both the US and the UK, and sold three million worldwide. Three years later, Plant revived the name of the first band he played in, the Band Of Joy, a '60s psychedelic folk outfit that also featured Zeppelin drummer John Bonham. But rather than a harking back to that long-distant past, Plant's new album, Band Of Joy, is a continuation of Raising Sand, in that it also explores Americana with Nashville overtones. It again features a well‑known female vocalist, Patty Griffin — although in a much less prominent role than Krauss's on Raising Sand. There's a change in the production team as well, with Burnett making way for country guitarist, singer‑songwriter and producer Buddy Miller, who co‑produced Band Of Joy with Plant, while the recording and mixing processes were helmed by Mike Poole. Band Of Joy had, a month after its September release, reached number three in the UK and five in the US hit parades, and seems destined to achieve similar commercial success to Raising Sand. Billed in a press release as "a timeless plunge into authentic Americana”, Band Of Joy contains country, gospel and soul covers from a few decades ago and before, but also more current songs by Los Lobos ('Angel Dance'), Richard Thompson ('House Of Cards'), Townes van Zandt ('Harm's Swift Way'), and two atmospheric epics by the Minnesota 'slowcore' band Low ('Silver Rider' and 'Monkey'). 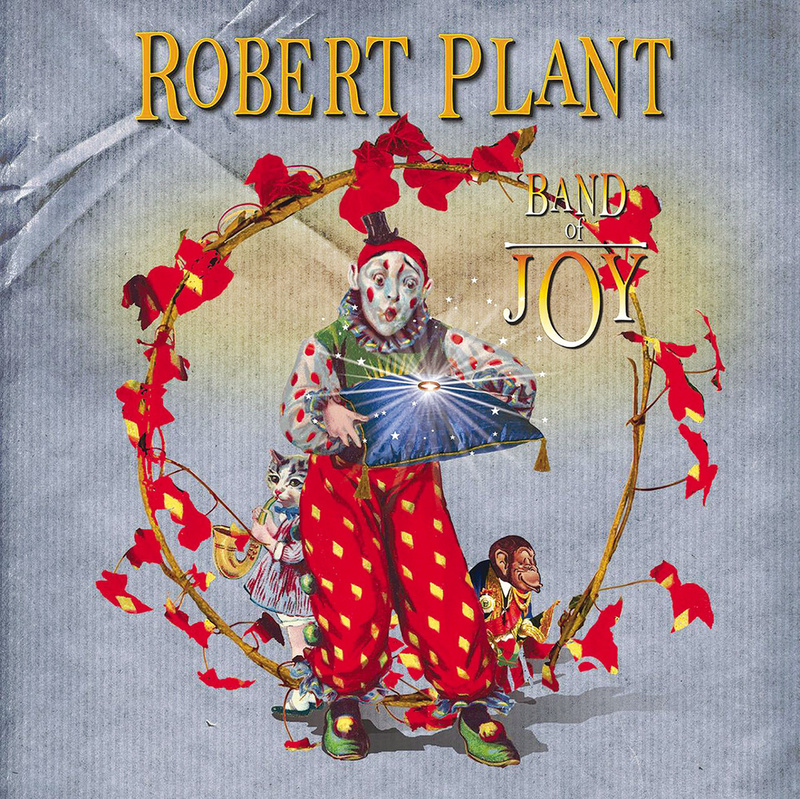 Band Of Joy is also more experimental sonically than its predecessor, though both were recorded in Nashville. 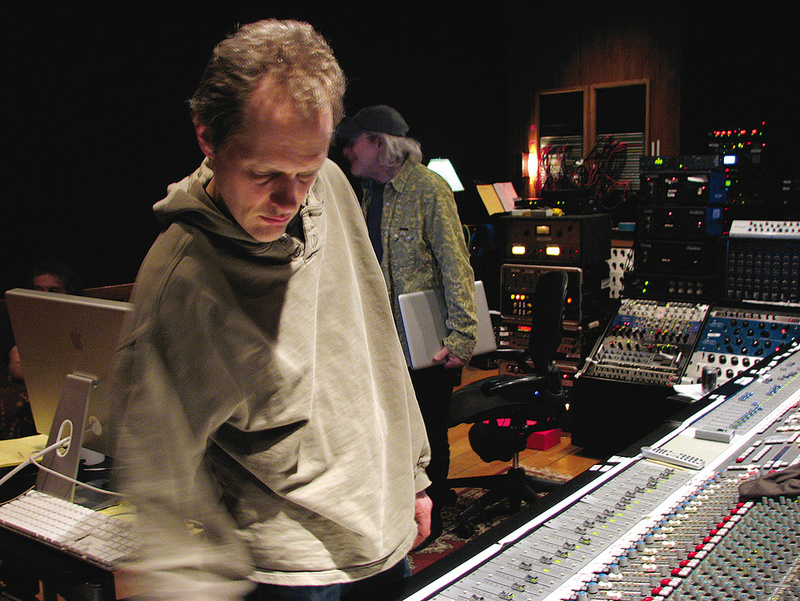 Engineer and mixer Mike Poole is a Nashville native who was planning to study commercial photography at Middle Tennessee State University in the early '80s, encountered "one of the first recording programmes in the country” there, and promptly decided that this was his future. He worked in various studios and became independent around 1990. "I went one step up on the autonomy ladder, and took a corresponding pay cut,” he laughs. Over the last 25 years, Poole has become a familiar and highly respected face in Nashville's studios, clocking up credits such as John Prine, Martina McBride, Patty Griffin, and many, many more. Poole got the gig for the Band Of Joy recordings via Buddy Miller, whom he regularly helps out whenever the guitarist doesn't want to do the engineering himself. According to Poole, the only pre‑production that took place was the song selection and choice of musicians, with the Band Of Joy becoming Miller on guitars and vocals, Darrell Scott on mandolin, guitar, accordion, pedal, lap steel and banjo, Byron House on bass, Marco Giovino on drums, and Patty Griffin on vocals. Bekka Bramlett also contributed backing vocals to two songs on the album. Poole: "Buddy and Robert talked a lot about what the album was going to be, but did not prepare many arrangements before we went into the studio. The musicians and I got some discs with songs before we went in, and there were some emails and conversations, so everybody knew what the influences and some of the potential songs were, and beyond that Robert and Buddy only made sure that we all went in with a similar mindset. The arrangements were worked out in the studio, and if they worked, great, and if there was no magic, we simply moved on. The songs were mostly recorded live in the studio, with very few overdubs or edits. Usually, we did at most two or three takes of each song. Most of what we were doing was about creating the atmosphere and character for the songs, and not sweating over details. Mike Poole at House of Blues Studio, where Band Of Joy was mixed. 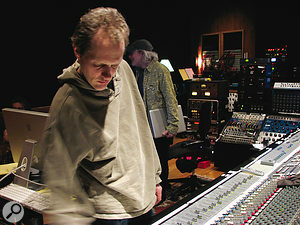 Producer and guitarist Buddy Miller is in the background. And so, predictably perhaps, Plant, Miller and Poole went for the classic record‑live‑into‑a tape machine approach that's been at the heart of Americana for 60‑odd years. The famous American producer Bill Bottrell once opined to this writer that Americana will soon bite the dust, as it's wedded to the analogue recording medium, while Pro Tools is moving music to a much more urban and synthetic place. "I would agree with Bottrell in terms of the difference between the sonics of analogue and digital,” says Poole. "There are genres for which DAWs work wonderfully, but I don't think that they are ideal yet for this kind of music. One of the reasons Buddy and I like working with each other is that we both like going to the same places sonically, so it's not a battle to try to get across what each of us wants, and we knew that the Band Of Joy album would be much more suited to analogue from a sonic perspective. One of the arguments of proponents of digital is that the playback sounds exactly like the input. That may be true, but with analogue tape the playback often sounds better than the input. I prefer to go with the medium that makes things sound better! "Robert also has a preference for working in the analogue domain: it's where he's from, and it sounds familiar and attractive to him. But most of all I think he likes working with the limitations of the medium, the fact that you can't easily slide tracks backwards and forwards in time and you might have to punch in a whole bar rather than a single note. Plus there's the vibe and approach that came from limiting ourselves to 16 initial tracks. 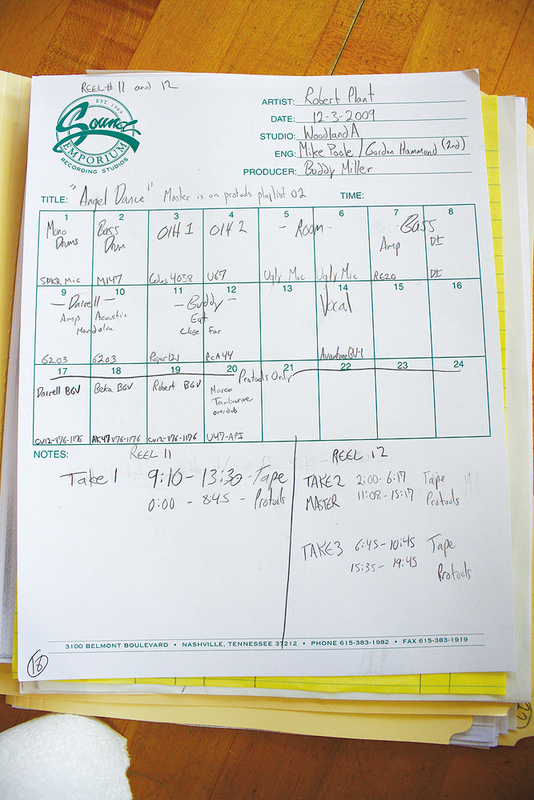 This meant that we had to make decisions early and we couldn't mess around with laying down many different drum scenarios, or whatever, which you tend to do when you have tons of available tracks. It's easy to get lost in a world of endless options. 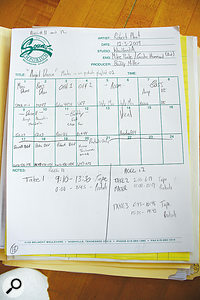 Despite Poole's obvious love for analogue, he also used Pro Tools for the Band Of Joy sessions. 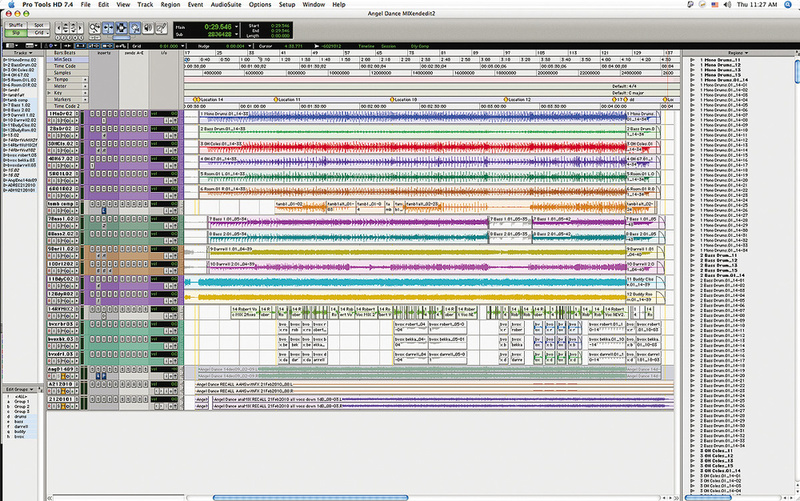 "I use Pro Tools all the time, because it has things that are incredibly usable. We can now do things that we could never do in the past. For the Band Of Joy project, we didn't only track to 16‑track analogue, but we also went straight out of the Studer into a Pro Tools HD system, via an Apogee AD16. The Studer would have been set on input while recording, so the Pro Tools was receiving only the coloration of the Studer's transformers — the sound was not coming off tape — and I would be monitoring off Pro Tools. "There were two different reasons for working like this. One was that we knew that we probably would need extra tracks for overdubbing and editing, and so we'd end up on Pro Tools anyway and would be mixing off Pro Tools. Monitoring through the system prevented any later surprises about the sound. We also didn't do any editing with razor blades — editing is so much easier in a DAW. I recorded to two‑inch RMG 900 tape, at 30ips. We listened a couple of times to compare the tape and the digital versions, but we all liked the tape version better. So when we felt we had a good take and that we wanted to do an edit or just move onto the next song, I immediately transferred the take to Pro Tools, at 24/96. Once we had the analogue colour, it was just a matter of being pragmatic to work entirely in Tools from then on. If an overdub needed that analogue colour, I'd fly it over to the tape machine and then back into Tools. It's not as ideal as having it on tape to begin with, but it gets you part of the way there, sonically. Apart from a few backing vocal overdubs that I didn't fly back, almost everything on the album has touched analogue tape. 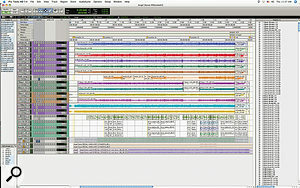 The entire Pro Tools Session for 'Angel Dance'. None of the plug‑ins were used in the final mix, and the edits on Robert Plant's vocal track (coloured green, about two‑thirds of the way down) were mainly to tackle sibilance issues. 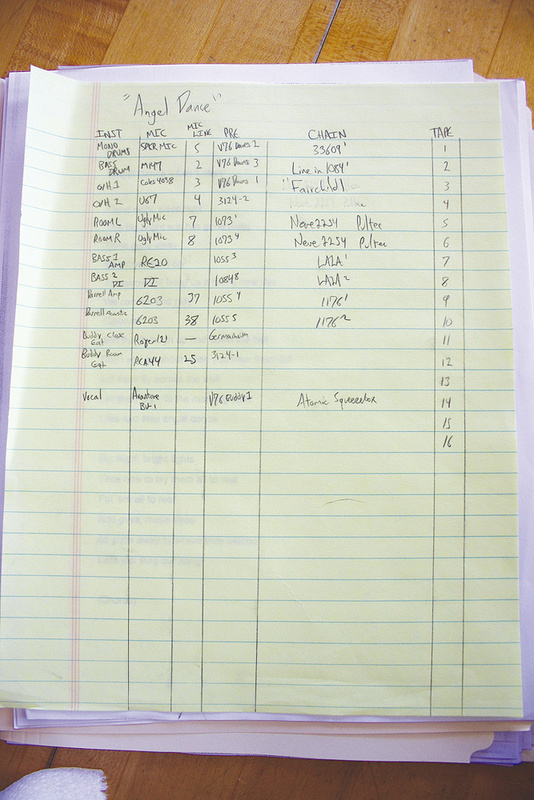 At the bottom you can see mixes were recorded back into Pro Tools from the SSL desk. "The other reason for our recording setup was to be able to quickly do another take whenever needed. 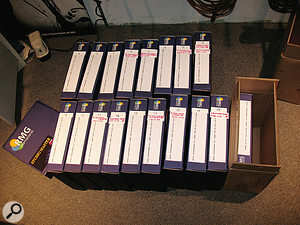 With Pro Tools I don't need to worry about how long the tape reel is, so I had it in record pretty much at all times. If we had reached the end of a reel, I could keep Pro Tools moving while rewinding or changing the tape, just in case the band was ready to record. One of the things that always happens in recording studios is that some magic is going on and the musicians look up at the control room with a look on their faces saying, 'Are you recording this?' I want to always be able to put my thumb up and indicate, 'We are rolling.' The musicians should never have to wait for the engineer. The sound of the format matters a little bit, but not as much as actually being able to be in record at the right time and capturing everything that's happening. I tried to roll the Studer for the actual takes, and Pro Tools was purely my failsafe that allowed me to keep things rolling at all times, just in case. 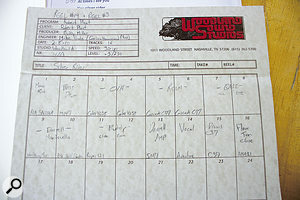 Initial live takes were recorded to 16‑track, two‑inch tape, before being transferred to Pro Tools for overdubs and mixing. 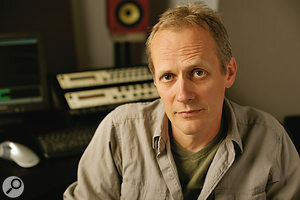 Homing in on the analogue equipment that was his focus at Woodland Sound, Poole elaborated on the recording stage of the album's opener and first single, 'Angel Dance'. Was his setup similar for all songs? Poole: "When Buddy and I work together it can be pretty free‑form, and it's not uncommon for us to use different setups depending on what the instruments are, for example whether they're acoustic or not, and where the musicians need to be to give the best performance. By contrast, when I'm recording a project that I'm not going to mix, or for which the direction isn't quite clear yet, perhaps because the corporate side wants to have its input later on, I would normally have a fairly standard way of recording. With the Band Of Joy project, however, I felt free to vary the recording setup a little bit, as was appropriate for each song. 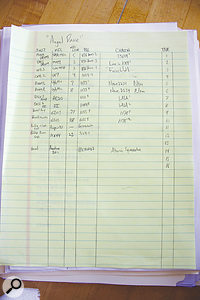 Poole was organised enough for this interview to supply a copy of his assistant Gordon Hammond's input chain sheet, reproduced on the left. Rather than explain each detail, Poole elaborated on some of the less usual aspects of his setup, for instance the Avantone BV1 on Robert Plant's vocals, which went through a Telefunken V76 and then an Inner Tube Audio Atomic Squeezebox compressor. Poole: "We tried a few mics on Robert, but the Avantone was definitely the best‑sounding. It gave us the picture that wanted of his vocals. I had only used that mic a little bit before, and it has definitely become a go‑to mic for me. It is very good at tracking sibilance, although after the vocal had gone through a compressor or two by the time I mixed, I had to do quite a bit of detailed work on 'esses' and mouth noises and so on. The Atomic Squeezebox is also fairly non‑standard, but it is a really good compressor. It reminds me a bit of the Summit Audio stereo compressor; it has the same feel but is a little bit more transparent. For the sound image we were after it was great. It also allowed me to put a highly dynamic performance on tape without the compression being audible. I always monitored through an [Urei] 1178, which was part of the mix path, and which gave the coloration we wanted to hear. "The RCA speaker on the drums is a tiny speaker from before the days of computers, probably from a small cassette deck or reel‑to‑reel deck. I would find a spot in front of the drums where there was a pretty good balance and I'd place it there. I used it to get a highly compressed, pretty nasty drum sound. I don't think I used a whole lot of it in the mix on 'Angel Dance'. The Neumann M147 did a great job on the bass drum, and the two RCA KU2A mics that I used as room mics are old ribbon soundstage mics known as 'the Skunk', because they have a large, six or seven‑inch, black, ball‑like windscreen with a white stripe down the back side, just like the stripe on a skunk. These were Gillian and David's mics, and they worked great on the room at Woodland, which does not have a lot of ambience, but the RCAs gave me a little bit of a different perspective than the overheads. The RCA MI6203 on Darrell's amp is a really mid‑rangey mic, which worked great for this song. Buddy's amp had a Royer R121 going into a Chandler Germanium mic pre, which has a feedback knob that can be used as a bass tone control with the gain setting that I use. The Germanium is somewhat related to the Neve 1055; the circuits are similar, even though it doesn't quite handle the same. This panoramic shot shows the live room at Woodland Sound during tracking. 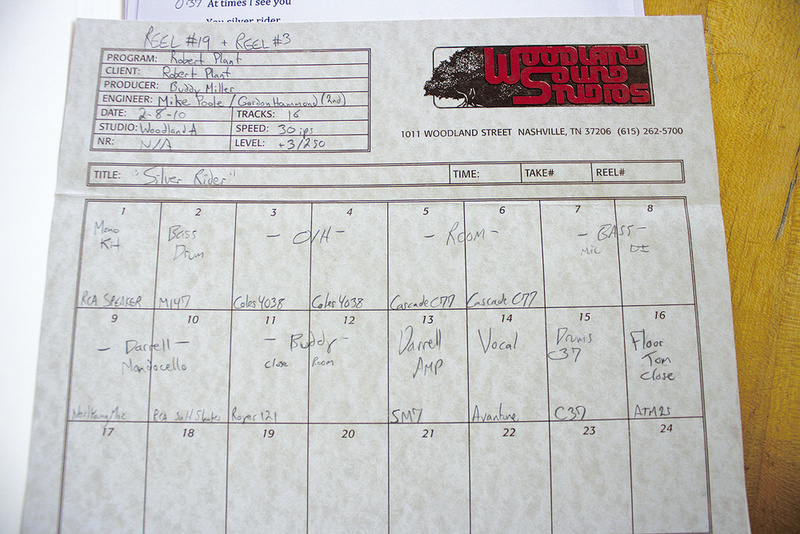 "The console at Woodland Sound is lovely, but with only 16 channels and four buses, not big enough to mix. I need returns when I mix, not only for effects, but also for submixes, and compression and other effects. We went to House of Blues primarily for the sound of an analogue desk. I auditioned a few consoles for mixdown, including the big Neve at Ocean Way in Nashville, through that made the sound a little too warm and fuzzy. The recordings sounded great on the SSL at House of Blues: it had just the right amount of grit, along with clarity. Since so much is going on in the bottom end on this record, it was also very important to have monitors and a room capable of accurate low end. The Hidley‑designed room and the Kinoshita monitors worked great for this. The SSL is very versatile in terms of EQ and dynamics, and the studio had all the coloration devices that I thought I might need: lots of API stuff, lots of Pultecs, lots of 1176s, lots of Neve modules. Another factor was that since I knew that we still had to do some overdubs, having a large board enabled me to set a mix up on one part of the board, and use another set of fader banks for overdubbing on another song. I rarely had more than 24 tracks of music to mix, plus another 20 returns. This meant that I had almost 40 extra faders to use for the overdub mixes. "Regarding my mix method, it really is mainly about getting a direction for what's going on. You push up the faders and figure out what the dominant vibe of the record has to be, like: this is a song where the electric guitar really needs to dominate, or this song is about the bass line, or in this song the voice needs to be inordinately loud. Once that's defined, it's a matter of figuring out what the other instruments need. Do the drums take up too much space, do they need to be more compact and darker? Does that acoustic guitar need to be bigger, or smaller, or more mid‑rangey? I work out the colour and general sound of each instrument, and might patch in three different compressors, or three different EQs, to see which one places the instrument in the right spot. "Because I had recorded the music, and because we had been working with a 'We do it the way we like it and we make our decisions early' mentality, I didn't have to do that much in the mix. This is in contrast to when I'm mixing a track recorded by someone else, or for which the direction was to be decided during the mix. With regards to Band Of Joy, the whole idea of the album was to have an acoustic feel, yet make it gritty. We didn't strive for hi‑fi or a clean sound or things like that. We all like stuff that's a little more in the gut, rather than just tickling your ears. So there were things that I did to make it sound more gritty, especially on Darrell's acoustic instruments, like running his mandolin track through a mic pre to get some distortion on it. Another panoramic shot taken at Woodland Sound, showing the booth occupied by multi‑instrumentalist Darrell Scott. "You can see the effects I used on my mix notes [right]. The effects at the bottom of the sheet — Roland RE501, Lexicon PCM42, Yamaha SPX90, TC Electronic D•Two, Roland SRV2000, AMS DMX15, AMS RMX16 — are going into my sends and returns. The RE501s, PCM42s and D•Two would all have been set to a delay, not set to a precise tempo, but definitely something that accentuated the groove. The House of Blues did not have a real plate for a long reverb, so I used the cheap SRV2000 for that: if you massage it the right way, you can get something that works really well. The DMX15 delay works as a sort of smearing device for things you don't want to be able to aurally locate as a point source. I tend to use the RMX16 for a short ambient reverb. Drums: Shep 1073 EQ, Chandler EMI TG12413, SSL desk compressor, Pultec EQ, Roland RE501. Bass & guitars: Universal Audio 1176, Pultec EQP1A3, Empirical Labs EL8 Distressor, Neve 31102. Vocals: Urei 1178, API 550, LT Sound CLX, Roland SRV2000 & RE501, AMS RMX16, TC Electronic D•Two. Auxiliary effects: Roland RE501, Lexicon PCM42, Yamaha SPX90, TC Electronic D•Two, Roland SRV2000, AMS DMX15‑80S, AMS RMX16.